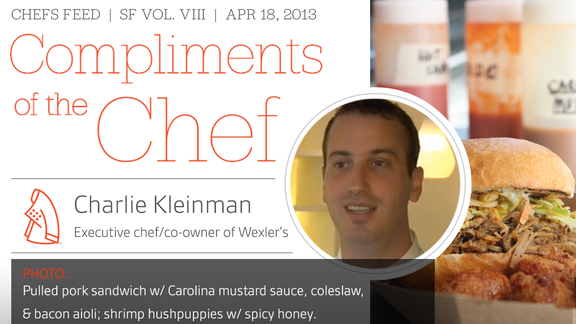 CK: I’m really excited about our new menu we just debuted on the truck, Wexler’s Back. Our chef Ryan Deal is bringing real Carolina know-how to the menu, and the pulled pork sandwich is out of this world; I could drink the sauce by the gallon. I also really love our gulf shrimp hushpuppies with spicy honey. We are hoping that people like the food so much that we become the go-to caterer for all of the Financial District offices. CK: David Kinch is the most talented chef in the country that I've had the honor to dine with. If it was feasible, I would love to spend some time in his kitchen to learn about his technique and how he works with his own farm; it's really impressive. After all, Manresa was where my wife and I ate the night we got engaged. CK: Reservations are a social contract, and they should be honored on both sides. CK: Don't go away. I am so scared of social media overtaking food critics. I'm talking about true food critics who do their best to be anonymous, who don't accept free things, who come back multiple times, and who fact check. We should be fighting to make them more powerful even if we don't always agree with them. Such a large percentage of press is generated by food criticism. They are very important to our industry and I hope they don't go away. CK: Don't expect to be a sous chef when you walk into the door of a restaurant. Despite what you see on TV, it takes a lot of hard work and a lot of "yes, chef" to get to a point where you know how to run a kitchen. Cooks who are willing to work their way up from the bottom are going to get a lot further than the ones who think they should graduate from culinary school and be managing right off the bat. CK: We're changing the lunch and dinner menus, so we'll have a bunch of stuff we won't use. It'll be a shmorgishborg of things left over at the end of the night.